By Tsukihime, May 16, 2012 in Completed Scripts/Plugins/etc. Counter-attack with default attack skill? How about choosing which skill you want to counter with? Supports both offensive and support skills, so maybe everytime you get attacked you want to heal yourself. To choose a counter-skill, go to the Skills menu, move the cursor to the skill you want to choose, and then press the A key. If you are not using the default keyboard, the skill is set to the "X" key in the game's settings. You can specify whether all skills can be selected, only certain skill types can be selected, or only the tagged skills. Where x is the skill ID you want to use as the default counter skill. 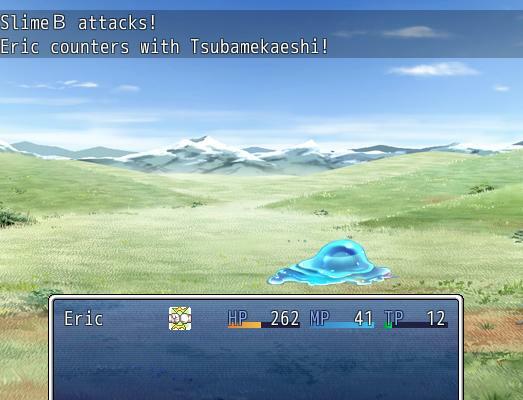 You sure work fast, Tsukihime! 1. I just tried pressing "A" when a character has no skills. (So pressed "A" on an empty spot where a skill should be). "line 181:NoMethodError occurred. undefinted method 'stype_id' for nil:NilClass"
2. Are you sure you can use it? 2. Ah cancel that I worked out why. It worked on your original test I did, but in my chain-attack script I have skills set to "only useable during a chain". I tried turning that off and it works. EDIT: How hard would it be to make it possible to select your counter skill during combat? You can disable battle switching as well. I've moved the counter_skill variable to Game_Battler. Does this have to be set manually at the start of the game? Having characters counter with different abilities adds a lot of favor, but what if I didn't want to bother the player with choosing the skill, i.e. by default the actor responds with a certain skill? Also, does this have a "force action" functionality or is it a free action for every counter attack? I can provide notetags for specifying default counter skills. Yes, you're basically pulling off free attacks everytime you counterattack. However, it will obey all skill usage conditions (eg: you will still consume MP/TP). I agree with Dark Horseman that the ability to set a character's counter skill by default would be a great idea. @Tsukihime - I've tried your latest code and it's throwing me a new error on battle start. "Script 'Game_Actor' line159: NoMethodError occurred. private method 'select' called for nil:NilClass"
I've added support for enemy and actor default counter skills. For some skill ID. You must have the skill in order to use it, so the enemy must have learned that skill. I will extend this to classes later, when I think of the best way to specify that actors take priority over classes. I've also improved the target system. Now I use the Game_Action.make_targets method which will handle all the ugly scope checks for me. I don't think it's the counter skills script that's raising the error. The latest copy has an empty line at 159. The error was in "Game_Actor" script. It was a conflicting Yanfly's Weapon Replace script and this one. I no longer needed the weapon replace script so I removed it and all happy now haha. Is possible to add this feature : make appear the counter skill on the screen but the player need to push a button to be able to activate it ? Yanfly combo script allow a similar featur : have to press a button. Of course the player will have a limited time to do it. Probably, but if I were going to add that, I would write a generic input script that could be used anywhere to trigger things and then just call it during counter-attack. Seems more useful than making something specifically for counter attacks. Nice implementation. Could I provide my two bits of wisdom? It would be great to have states that set the counter attack skill to a specific skill. That would allow some additional design space without being too hard to implement. Would it be possible to add eval to the notetag so that the counter-skill would only activate on certain conditions being met? Such as an actor's TP being full, or half-full, or at low HP? Probably, but I don't plan on implementing it. You'll need to first figure out how to actually specify it. Well, boo. Would be nice to be able to control this even further, but it's a great start. Would you mind taking a look at my support topic about Window_BattleLog? I have a feeling you'll be able to figure that one out fast. The problem is not it being hard to implement. I just have no idea how people should be using it. The things I come up with are more for computers and not people. I couldn't tell if it was from Yanfly's Lunatic States script with the Punishment & Protection packages or your Counter Skills script. You could try to find this out by running some more tests. Test it with/without each script installed. If I have a counterattack state on & I'm attacked, does the skill selection show up automaticly or do I have to push a button at the right time before a regular counterattack goes off? You go to your skill list and press the A key to select a skill to use for counter attacks. Is that during battle or on the menu? I may have to experiment on which is my 'A' key seeing as I'm using a PS3 controller to play my game.